In the early months of this project, I have been corresponding with a number of current and former students and staff at the University, most of whom have told me the wartime story of someone two generations or more above them, commonly a grandfather, great-grandfather or great-uncle. Today I have published a daughter’s profile of her father. Anne Wolff’s story of Tom Heald, a Staff Captain in the Cheshire Regiment, is an emphatic reminder that, despite the distancing inherent in the term “centenary”, the First World War is not far removed from us in generational terms. Tom’s story also tells us much about the processing of memory and about evolving attitudes towards memory and the First World War. Against official rules, Tom kept wartime diaries. Largely factual, they nonetheless also offer more personal reflections on the war’s immediate impact on his life – the entries on the death of his childhood friend Basil are particularly poignant, for example – or on its meaning for his post-war prospects. After the war, and like many others, Tom suffered vivid war-related nightmares which became especially acute when the Second World War broke out in 1939. Anne, then 18, was aware of these, but recalls that her father otherwise rarely spoke of the First World War, and she knew nothing of the diaries until she found them after his death in 1980. Had he simply forgotten their existence? Or had he deliberately not spoken of them? And, if so, why? No-one can know for sure. But what is certain is that, without them, or the diaries of other combatants who chose to ignore the rules, we would today regret the absence of such precious accounts of wartime experiences. Today, the institutions of the very state that forbade the writing of such diaries in 1914 seek to archive and to profile the memories those diaries record. Now that’s what I call progress. 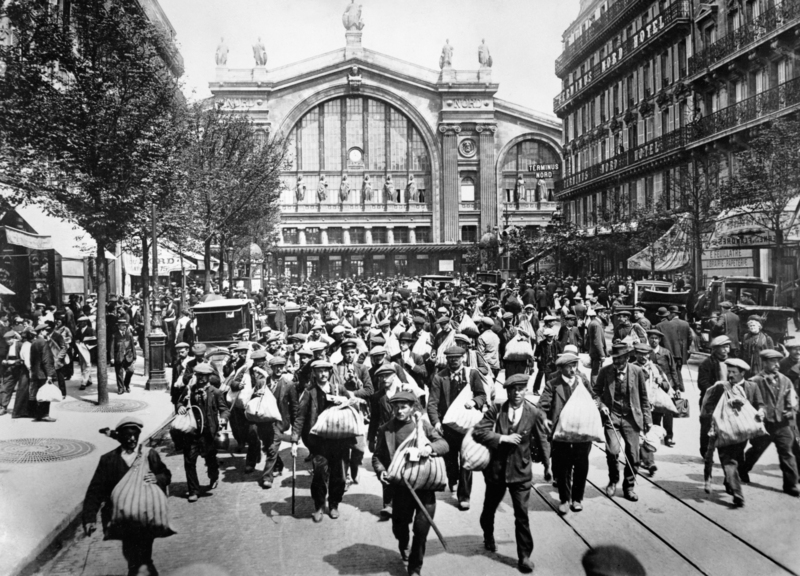 One of the most interesting aspects of this project for me relates to the connections that are emerging between different stories and memories from or about the period of the First World War. I have therefore decided to include on the blog a series of occasional editorials which highlight these. The first concerns Niamh Thornton’s story about her grandfather, Pádraig, which prompted an earlier contributor, John McGarry, to get in touch about a memory in his family about the Black and Tans. 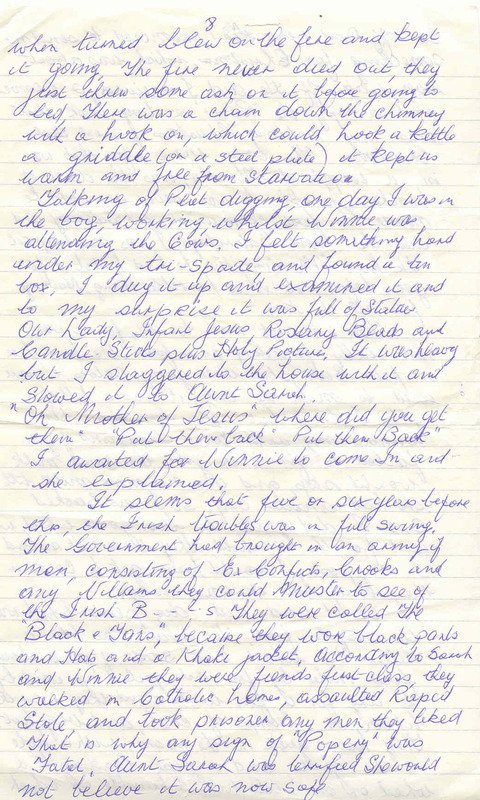 John has sent in a page from a letter written by his uncle, also named John McGarry (b. 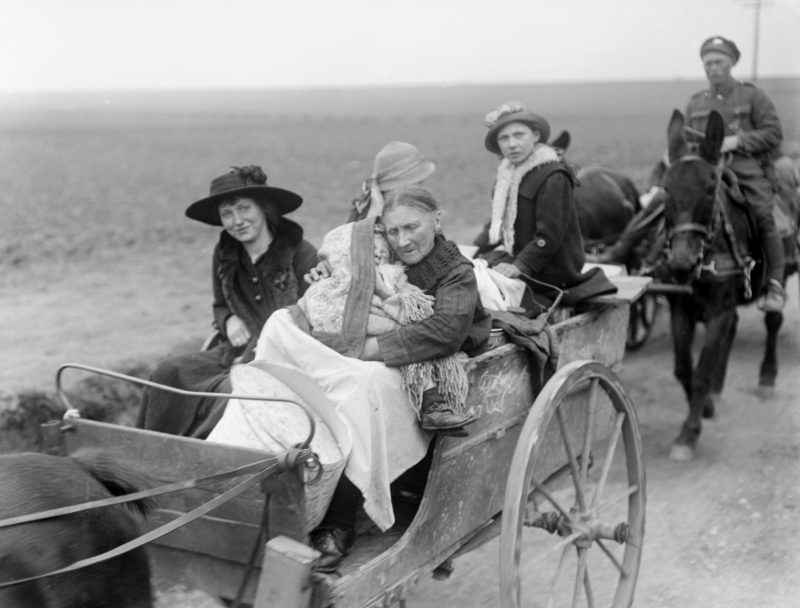 1912), who, in around 1924-25, was sent from Liverpool by his father to help out on the very poor family farm in Camly, McCullagh, County Armagh. Young John hated every minute of it. The page from the letter is posted left (click on it to increase the size). In it, John describes digging peat for the fire when he accidently comes across buried religious items, hidden by owners who wanted to keep them safe from the Black and Tans, and who were unconvinced that they were no longer around. The Black and Tans had actually been disbanded in 1922.